Shaw pointed out that the poll was completed on the eve of the South Carolina primary and said the results there — and Jeb Bush’s decision to drop out — could change the dynamics in Texas. He also said all three of the top candidates have good reason to campaign here since Texas is not a winner-take-all state and strong second- and third-place finishes could win some delegates here. Henson also noted Bush’s small numbers. “There was no redemption in Texas for Jeb Bush, even before South Carolina,” he said. 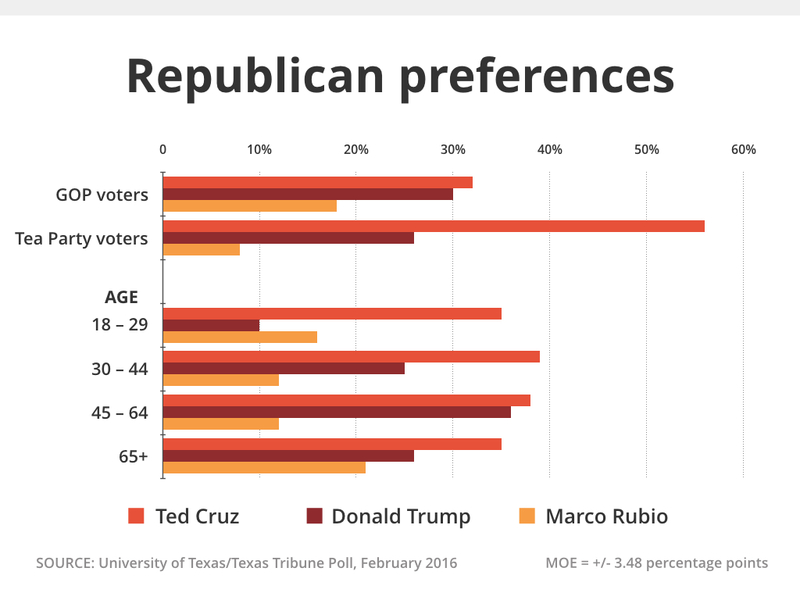 Cruz led in all age groups, notably among voters ages 18 to 29 and voters ages 30 to 44. Trump pulled close among 45- to 64-year-olds, and Cruz had a 9-percentage-point lead among voters over 65. Rubio had 21 percent of that oldest group — his best showing in the age brackets. The Cruz and Trump voters were more certain of their choices than the voters attracted to other candidates. More than two-thirds of their voters said they were “extremely certain” about their choice of candidates, compared with 41 percent for Rubio, 29 percent for Carson, 27 percent for Kasich and 22 percent for Bush. Few of those surveyed expressed uncertainty about their choice, preferring to select either “extremely” or “somewhat” certain. But in Bush’s case, 24 percent said they were “not very certain” about voting for him and 11 percent said they were “not at all certain” about it. In Carson’s, 21 percent were “not very certain,” and 10 percent of those who said they support Rubio expressed some doubts. For all of the talk about shaking things up in this year’s elections, only 15 percent of Republican primary voters said that was the most important factor. Their first reason for choosing a particular candidate, with 21 percent, was to “improve the American economy,” followed by giving the Republican Party a good chance to win in November. As it turns out, those were also the top two reasons for Cruz voters (he and Trump both got relatively high marks for “shake up politics as usual”). Trump’s voters said "improve the economy" and “reform immigration policy” were their top reasons for voting. More than a third of Rubio’s supporters — 36 percent — said they chose him because they thought having a good chance to win the general election was most important. Cruz had a significant lead over his opponents among voters with “some college,” pulling 50 percent of those votes to 29 percent for Trump and 6 percent for Rubio. That flipped among post-graduates: Rubio got 35 percent, while Cruz and Trump each got 20 percent. Voters with two years of college favored Trump. 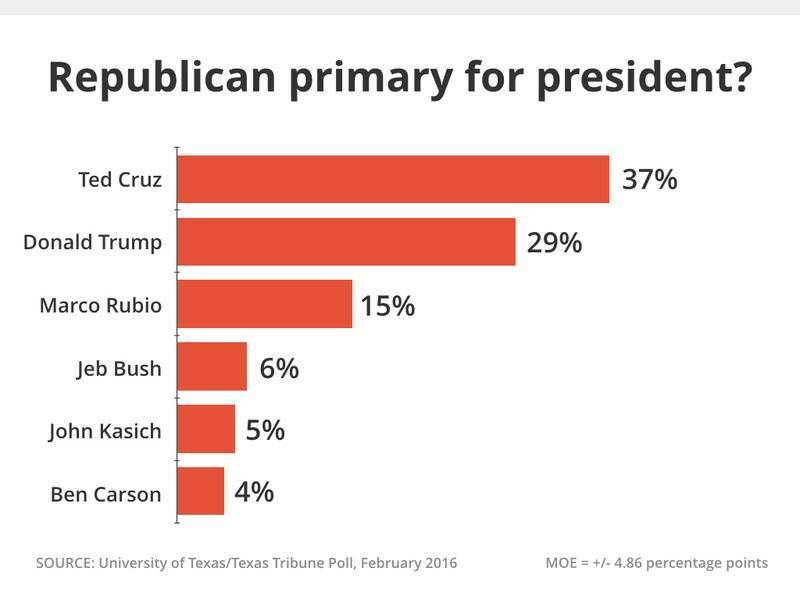 Cruz led Trump by six percentage points among high school graduates and among voters with four years of college. The three leaders were the only Republican candidates to attract double-digit percentages of churchgoers. Cruz did best, pulling 38 percent of voters who attend church more than once a week, 38 percent of the once-a-week worshippers and 54 percent of those who said they attend church a few times a month. Trump was second in each of those groups, with 22 percent of the first group and more than a quarter of the other two. He also did best among voters who never attend church: 32 percent of those were with Trump, 27 percent with Cruz and 21 percent with Rubio. Cruz led the pack with male voters, getting 40 percent of them to Trump’s 26 percent and Rubio’s 15 percent. But Cruz, at 33 percent, and Trump, at 32 percent, were in a virtual tie among female voters. Rubio had the support of 14 percent of those voters. 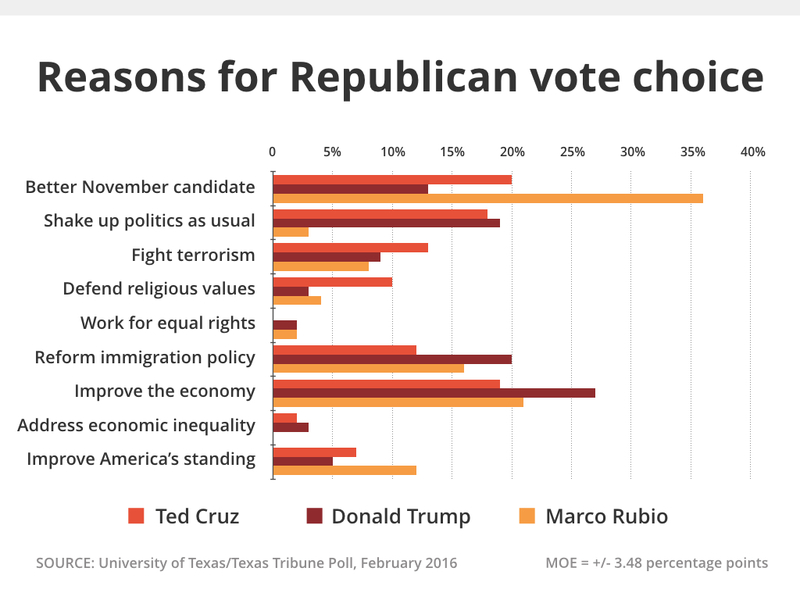 The University of Texas/Texas Tribune Internet survey of 1,200 registered voters was conducted from Feb. 12 to Feb. 19 and has an overall margin of error of +/- 3.48 percentage points. Among registered voters in Republican primary races, the margin of error is +/- 4.21 percentage points; in Democratic primary races, it is +/- 5.44 percentage points. Numbers in charts might not add up to 100 percent because of rounding. This is one of two stories — the other is about the Democratic primaries — from the latest University of Texas/Texas Tribune Poll, and today’s stories are the first of several from that survey. Tomorrow: Texas voters on which candidates would make great — or terrible — presidents.